I first told this story last fall as Jose Bautista crossed the 50-home run plateau and was victimized by assumptions about PED’s or corked bats or, I don’t know, deals with the devils. With the Jays’ slugger now having crossed the 20-home run plateau before the first of June I think I should tell it again. So on March 3, 2007, I stepped off a flight from New York and went directly to the Pirates-Yankees exhibition game in Tampa and who’s the first person I see? Pirates batting coach Jeff Manto (naturally, it was his last year on the job). I asked him what he could tell me about his Pirate hitters that I didn’t know; who I should watch for; who might surprise me. 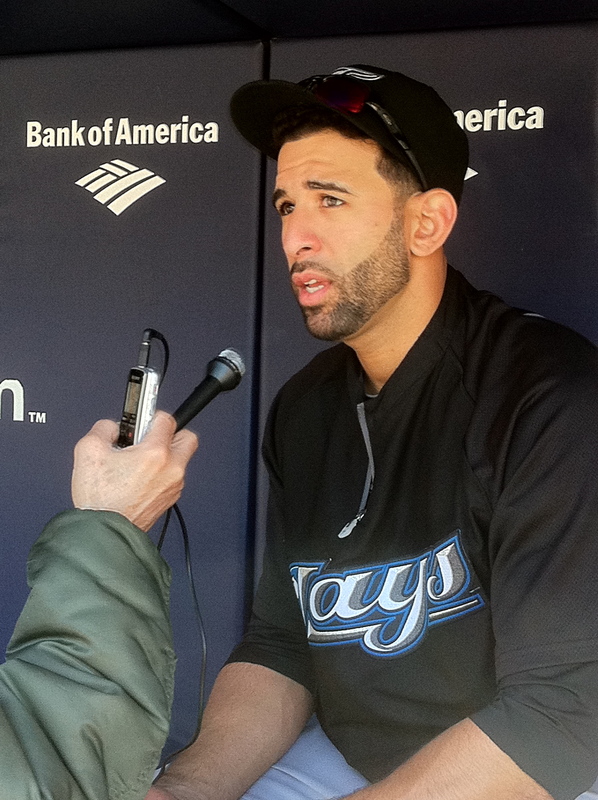 Bautista had 569 at bats last year in Toronto and ended at 54-124-.260. If you took his rates of production during his first four full seasons and gave him 569 at bats each year, he’d have averaged 20-73-.238 – so the power was there; this was not Brady Anderson coming out of nowhere. As I noted last year, until George Foster suddenly hit 52 homers for the 1977 Reds, his career high for blasts was 29 – and he was already in his seventh season in the National League. Cecil Fielder spent four years unable to crack the line-up of the Blue Jays, topped out at 14 homers, went to Japan for one year, and came back to hit 51 for the 1990 Tigers. It is a rare thing to see a slugger grow from good to great – but it’s not impossible. So lay off Bautista. And if you see Jeff Manto (now the minor league hitting instructor for the White Sox) say hi for me, and congratulate him on his prescience (oh and the other kid he really liked back when he was his first manager in the minors, some guy named Ryan Howard), and tell him the Pirates shouldn’t have dumped him as battng coach, nor should they have dealt Bautista for catcher Robinzon Diaz. Great story, Keith. A life lesson, too! Some peeps just can’t stand to see others have success. My mom used to say that “it is sick to rejoice in another man’s misery,” and I think it is just as sad to not celebrate his victory! I have learned so much here at the Baseball Nerd. Just today on twitter, I was able to name a favorite player from two opposing teams! That would be Youklis for the Red Sox and Cabrera for the Tigers. (I hope I was right.) I am also pondering a line from DeNiro in “The Fan”…”Baseball is better than life, it’s fair!” It seemed like a great line until the character turned out to be nuts. Truth is, not much is fair out there. But as long as you use a keen eye and tell the truth, things can get better. You are better than baseball, KO. Have a good night! As a life long Jays fan, I does feel good to see a Blue Jays player get some mainstream recognition once in a while… However, by the time that they are recognised, they are often ex-Blue Jays players such as Roy Halladay. First, saying a guy could possibly hit 25-40 homers is a far cry from what Bautista is doing now, which is approaching the kind of home run success only attained by McGwire, Sosa, and Bonds – all of whom were juiced. In his early days with the Pirates, Bautista was being touted having the skills to be practically the next Clemente, so Manto wasn’t exactly alone in seeing tremendous potential for Bautista. Unfortunately, he turned out to be a head case who didn’t hustle and didn’t produce. They Bucs probably got more out of Robinson Diaz that Bautista. What’s the old Texas saying about “Fool me once …”? That is– what is the non-mangled version? Baseball fans have marveled at feel good stories before and believed it was just natural talent. How many times have we been fooled? But I wasn’t thinking Bautista had a chemical advantage. I thought maybe he was getting signs relayed to him somehow. Of course, only the Yankees are accused of doing that! But it’s like he knows which pitch is coming in advance so he’s able to load up and start his swing early. Hitting is hard. Even great hitters are made to look foolish and Bautista rarely looks that way. I won’t judge him based on suspicion but he needs to quit looking like he’s the baddest dude ever with all the styling he does and glaring at the pitcher. I’m not going to enjoy what Bautista is doing if he can’t even look like he’s enjoying it himself– and he’s no Barry Bonds, with or without PEDs. Nicknames like that are part of why we miss you on SportsCenter!! I like the valuable info you provide in your articles. I’ll bookmark your blog and check again here regularly. I am quite sure I’ll learn plenty of|many new stuff right here! Best of luck for the next! This is very fascinating, You are an overly skilled blogger. I’ve joined your rss feed and look forward to in search of more of your fantastic post. Additionally, I have shared your website in my social networks! a blogger, and I was wondering your situation; we have created some nice procedures and we are looking to trade techniques with others, why not shoot me an email if interested.